The Innovation News Center is the home of the College’s news, weather and sports operations. The two-story, 14,000-square-foot space replaced three 1980s-era newsrooms, and provides nearly 100 seats for reporters, producers and editors working together to report the news in English and Spanish for the College’s many distribution channels, including WUFT-TV, WUFT-FM 89.1, ESPN 98.1/850 WRUF, Country 103.7 the Gator, WRUF-TV 6, wuft.org and other affiliated websites. 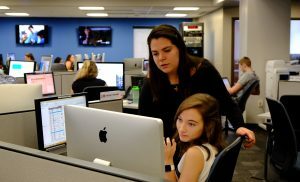 The facility, which opened in the fall of 2012, allows the College’s students to learn to report from multiple platforms in a real-world environment that prepares them to produce content at any type of media organization. 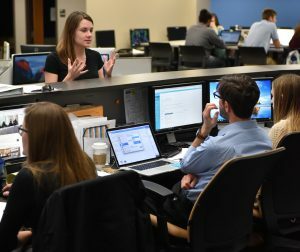 The INC is organized around a “super desk” where daily producers and editors from web, television and radio are seated and manage coverage on each platform. Adjacent are pods of seating for journalism and telecommunication students as they report and produce stories. Sprinkled throughout are television and radio editing stations and audio booths. The space also includes a mini-studio (or “live-shot area”) where the College’s students create video content for streaming and for broadcast on WUFT-TV and WRUF-TV. For a list of news awards won by student journalists, click here. The second-floor space includes a video editing laboratory, a conference room and the College’s content and product incubator, Hatch. All of these spaces overlook the news floor and are connected by two open staircases and bathed in natural light from the clerestory window overhead. From 6 to 10 a.m. and 4 to 7 p.m. weekdays, student producers, under the supervision of professional news managers, write and anchor local news updates on the NPR affiliate for North Central Florida, Florida’s 89.1 WUFT-FM. Every weekday from 10 a.m. to 11 p.m., the INC produces hourly news updates on Florida’s 89.1 WUFT-FM. Students working for ESPN 98.1/850 WRUF-AM also produce short updates on what is going on in the world of sports that run on the AM channel. Versions of the updates are also produced for the College’s commercial FM country-format station, as well as commercial partner stations owned by Entercom. The 24/7 news, weather and sports format TV station is broadcast digital over-the-air and on Cox cable. Students produce news and sports updates that are interspersed with weather updates by the College’s professional meteorologists and student meteorologists in training (MITs). Trainees work through a progression of courses and independent studies, and produce weather segments on WRUF-TV, provide reports for the College’s radio stations and anchor weather on WUFT-TV’s First at Five newscasts. Stream the station. 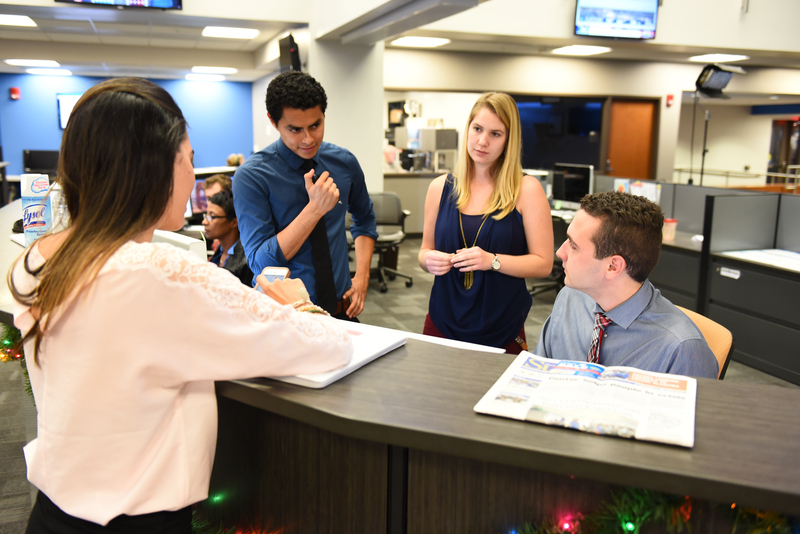 Student journalists discuss a news story in the INC newsroom. The news content produced by the INC is supplemented and posted on WUFT.org, which serves the local news audience covered by our terrestrial broadcast towers. The site, which is staffed by students and professionals, also features original enterprise stories, multimedia special reports and podcasts. This Spanish-language platform is where bilingual students produce news content for radio, TV, web and social media. Under the supervision of a professional news manager, reporters do a weekly radio show that airs Saturday mornings on WUFT-FM, 89.1. They also produce short news and sports updates seen on WRUF-TV 6, a live newscast on Facebook one day a week and online stories.